In the summer of 2004, Strescon was awarded two New Brunswick Department of Transportation contracts to supply 120" concrete pipe. Caldwell & Ross was working on Route #1 in St. Stephen installing 70 pieces and Atcon Construction was working on Route #2 in Longs Creek installing 30 pieces of the 8'-0" long, 40,000 lb pipe. As both contracts were brook crossings, the pipe also had factory installed fish weirs. Strescon was the first supplier in the Maritime provinces to produce this size pipe using the dry cast method. 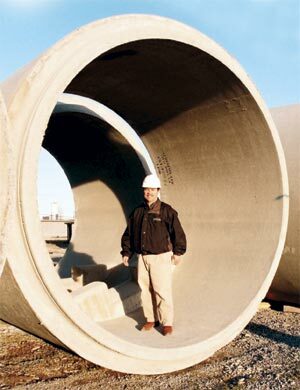 Up until then, our facilities were only able to produce pipe bigger than 96" using wet cast methods. This meant only 2 pieces of pipe could be manufactured each day. By using the dry cast method, the project schedules were shortened from 72 days to only 14 days.